UNITED NATIONS, Aug 20 2018 (IPS) - I woke up on Saturday morning with the heart-breaking news that our dear Kofi is no more. The peoples of the world are unequivocal in expressing their feelings of the love, respect and recognition that they have for his qualities of head and heart. Knowing him for more than four decades, my calling him “Saint Kofi” because of what he stood for, started at the beginning of the new millennium. I recall with pride that the African Group decided to pick my Presidency of the Security Council in June 2001 to present a rather-early proposal for Kofi’s second term. As the Security Council President, I introduced the resolution for his re-election to the General Assembly on 29 June 2001 which it did that very day with thunderous acclamation. No Secretary-General both in the past and in the future, I believe, would know this most complex organization as thoroughly and as intimately as him. He was superbly knowledgeable in every aspect of UN’s work. Kofi’s knowledge of the UN as the world’s biggest and most important multilateral body has been unparalleled. Starting at the entry level and reaching its topmost position accorded him a unique insight and understanding. As the Chairman of Fifth Committee dealing with his UN reforms and restructuring in his first year as Secretary-General, I had experienced that time and again in the most enlightening way. I recall Kofi’s invaluable advice as the Director of the UN Budget office when I was Vice Chair of the Committee on Programme and Coordination (CPC) in the early 1980s. 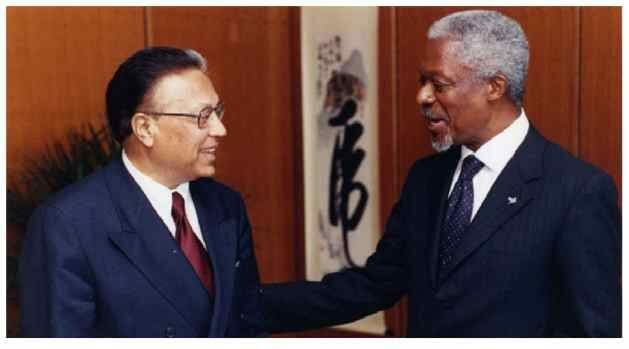 It was a distinct honor for me to serve in his team beginning in 2002 as the first Under-Secretary-General and High Representative for the new office for the most vulnerable countries of the world, for whom he was himself a genuine and persistent advocate. Personally, it was a pleasure for me to have received Kofi’s support, encouragement and advice for my initiatives in piloting in the General Assembly the UN Declaration and Programme of Action on the Culture of Peace in 1998-99 and in achieving the political breakthrough for UN Security Council resolution 1325 on women’s equality of participation in 2000, both taking place during his first term. His personal connection with his staff, particularly those at the functional levels, was full of compassion and collegiality. He knew hundreds by their first names. I will miss Kofi tremendously.